OSWEGO, NY – An ELA Pep Rally, including Mr. Buc along with cheerleaders, prepped the Kingsford Park Elementary third, fourth, fifth and sixth grade students for state testing. Cheers were loud and enthusiasm high as student testing approached. 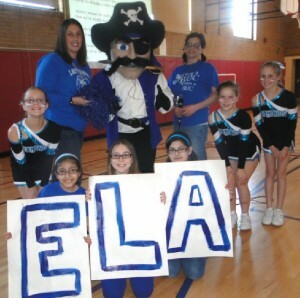 In front are the “ELA” banner persons Chloe Gunn, Victoria Crisafulli and Abby Faul while the cheerleaders are Julie Roman, Alyssa Morley and Katie Fierro. Fifth grade teachers Jessica Burridge and Kelly Moxley joined with Mr. Buc.